I’ve had lunch at The Grand Stage on the 2nd floor of Western Market twice in the past couple of weeks, and I’m pretty impressed, and only have one quibble. Food: Fairly comprehensive offering of trad Dim Sum. Beef balls, siu mei, wanton, turnip pasties, radish cakes, cha siu bao, sticky rice in lotus leaves – you get the picture. The execution is also exceedingly good, and I think that it’s some of the tastiest Dim Sum in Hong Kong. It had a certain freshness and crispiness which was very pleasing. However, and this is just stupidity – it arrived at the table barely warm which really took the edge off for me, and was frustrating – otherwise I’d have been jumping up and down on sofas and declaring a love of Katie Holmes. The first time I went and experienced this lukewarm fare I put it down to being part of a large group and never being the first to dip into the baskets, but the second time I went we were just a party of four, so the sad fact is their service process must be all screwed up. It just goes to show how good it is though that the taste and freshness shone through the lack of warmth. Ambience: The Grand Stage must be one of the biggest spaces in Hong Kong. It is fantastic to be under such a soaring ceiling. It’s all a bit Mainland nightclub what with the red walls and the neon lighting, but it’s a lot of fun and I love the chandeliers. The great thing about the high ceilings is that even when you’re surrounded by 400 other people, the sound gets whipped away into the rafters so you don’t feel that it’s super noisy. Service: Pretty typical Hong Kong. I’m a gweilo with non-existent Canto skills so I’m used to being misunderstood in Dim Sum restaurants. It was always easy to catch someone’s attention even if it was difficult to convey my meaning, so the fact you got swift service was good enough in my book. Price: Not much more than $100 per person for a really decent amount of food, so good value. Location: In Western Market right at the end of Des Voeux Road in Sheung Wan. Best to book ahead as it seems to always be busy. Tel: (852) 2815 2311. As I’m often in Sheung Wan I shall return to The Grand Stage again I’m sure. If I had holidaying visitors coming to Hong Kong I would probably take them here over Luk Yu Teahouse and the Dynasty in Wanchai’s Renaissance Harbour View just because it’s a bit more fun in the case of Dynasty and better food and service in the case of Luk Yu. For business lunch though, I would definitely opt for Dynasty. I was vacillating over the category of The Grand Stage – Mama/Huhu or Candy, but even though the temperature wasn’t spot on, the food was very good and the overall experience has tipped it into the candy category for me – maybe it’s the New Year spirit that is making me feel generous! I’ve known that 40 Gough in NoHo has been super popular for lunch for years now, but haven’t been for ages. As I had such a good lunch at Lot 10 across the street a couple of weeks ago I thought I’d do a compare and contrast, so went for lunch at 40 a couple of days ago. Food: Hmm. Really just a bit crap (gosh I’m all eloquence today!). To start, I had a papaya salad which was half a ripe papaya with the seeds removed with some slightly over-done dressed prawns within. It was as odd as it sounds: ripe papaya doesn’t really work in a salad, especially when it’s not dressed in anyway nor cut into morsels you can eat with the other salad ingredients. Clumsy. My companion had a Caesar salad which consisted of maybe two ripped up Romaine leaves, a slosh of dressing which had hardly brushed up against an anchovy and a couple of filings of parmesan, all spread out in a single layer on a dinner plate. Clumsy. For his main, my dining partner had a rack of lamb which was underdone and over-salted, and I had a half-raw, half spring chicken. So, clumsy and potentially dangerous. The accompaniment on the side of the plate was a splodge of garlic mash with one broccoli and one cauliflower floret wedged therein, and four whole, cooked, unseasoned cherry tomatoes placed on top, (which just weed juice onto your plate and didn’t go with the rest of the veggies). V strange, and definitely clumsy, and lazy as each main course had the same accompaniment. (There is also an odd twist that they serve you slices of garlic bread before you begin – bit baffling). 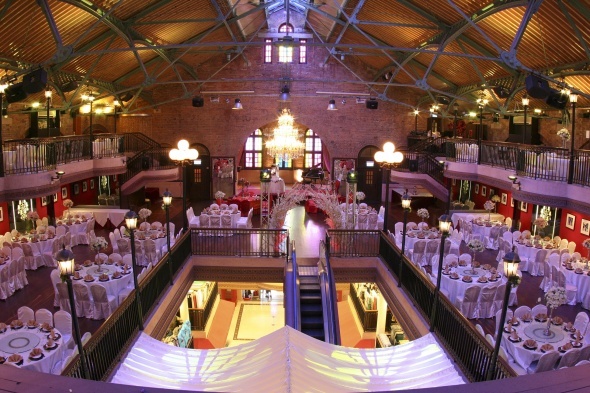 Ambience: You can’t fault the decor, location. It’s clean, white and smart. It’s small but they don’t ram the tables in and there are a few outside. It’s a great spot. Service: Service was fine. Friendly and couteous. Price: Set lunch price varies with the main course you choose, but ranges from $118 to about $140 I think, so it’s not expensive. Location: Opposite Lot 10 on the corner of Gough St and Shing Hing Terrace. Lovely location, quiet, off street, and once again you are always entertained by the shuttlecock guys who seem to play every lunch time. Tel 2851 8498. 40 Gough Street, Central, Hong Kong. I can only imagine that Gough 40 is so busy for lunch because of the location. Lot 10 opposite is (surprisingly) cheaper and the food is streets ahead, (although maybe 40 has to be more expensive at lunchtime because it certainly struggles for dinner custom). I was definitely underwhelmed and although I was impressed with the service and ambience, the food is just too poor for a return trip. I was going to class this Mama/Huhu but can’t because of the food. The main point of a restaurant is to serve decent food, not to look nice and have good service, so Caustic it is I’m afraid. Right – on to Lot 10. Thanks to a couple of comments posted to Caustic Candy, and a scour of Chowhound I decided to give this much ignored (by me, deliberately) little bolt hole a try. *Of course the shining example of private kitchen’s for me used to be Frank Ching’s Tribute when it was on Cochrane Street, but that may have been something to do with the wonderful evenings I spent there with some friends of his, where we used to ransack his kitchen after-hours and he’d let us taste all his latest creations. The sooner he’s up and running again the better – Go Frank! Food: French inspired, locally sourced fish where possible, local produce used where possible – yes, yes, yes. This is what we want Hong Kong. Companion had French onion soup to start – very good, tasty stock base. For mains, I had the crispy pork shoulder on a bed of lentils. For those of you who like bbq pork neck at Thai restaurants, this pork shoulder had a similar texture – incredibly tender with slightly crispy edges. And Oh My Lord the Lentils! If you think lentils are for hippies, too Robert Carrier 70′s or only fit for dal, then you are very wrong – Lot 10′s lentils were a revelation. They were so subtly seasoned and spiced, they were wonderful (how geeky is that?!). My wonderful (and in no way erstwhile) dining companion had a steak with a macaroni gratin - steak was good quality: a well cooked slab of flesh. Macaroni gratin added a very light accompaniment, but was a bit too oot of the ordinary and not a winning combo for either of us – but hey, worth a try. We did though have lettuce with peas and bacon (grrr, yum, yum) and duck fat roasted potatoes (almost…almost…as good as my own), so overall the food was very well received. Drinks: Reasonable and well thought out wine list. We had a very decent Torbreck for around $400. Ambience: A bolt hole. There are only 3-4 tables downstairs (and it’s a push past the kitchen to sidle into the washrooms). A couple of tables outside on Shing Hing Terrace, and another larger room good for private parties hidden upstairs. Clean lines, white linen, white walls (slightly small tables and chairs, but then it’s a slightly small restaurant). Service: Quiet and competent service. Price: We paid around $1200 for a meal for 2. Mains were around $250 on average. Food was quality, and wine a good price, so I think good value for the experience. Will return. Location: On corner of Gough St and Shin Hing Terrace, so nice and quiet. 34 Gough Street (NoHo), Central, Hong Kong. Tel 2155 9210. Went for lunch last week and had a lovely meal. Just $98 for two courses + tea or coffee – fantastic value. I had home cured gravlax and a local caught snapper, grilled which were both very good, and my companion had a good sized, tasty Caesar salad and a very decent steak. We sat outside on the street terrace and were thoroughly entertained by the guys playing shuttlecock (Jianzi in Mando, not sure what the Canto is), one of whom must have been about 80 and was the very definition of spry. A perfect break from the office in the middle of the day, and such good value for money (we even succumbed to sharing a chocolate pot for desert for $30 extra – delish). Will become a regular haunt. Popped along for lunch at the new Mrs Jones restaurant at the top of Pottinger St a few days ago. I’ve always had a soft spot for Concept Creations venues so far as their service has generally been really good and friendly. However, I have to say that lunch was a bit horsey horsey tiger tiger and that’s forced me to invent a new category on my blog, (hit and miss to the those not in on the Mando reference). Food: Italian. My companion and I opted for a 3 course set lunch. We both had salads to begin with, which were let down by the overcooked mush of carrots, and an indifferent mix of leaves and Parma ham. My pasta main was disappointing, primarily because it was bog-standard bought pasta – literally the farfalle I buy down at the supermarket. Now, I think that’s a bit of a cop out. Fresh pasta using organic flour would be cheaper to make than buying mass produced dried stuff, and definitely less expensive than some of the very good quality dried pastas, and is super easy to make – so why serve your customers the boring bought stuff, when you can make a selling point out of having fresh, organic pasta instead? My companion’s main course on the other hand was very tasty – Chicken with olive mash and a creamy mushroom sauce. What absolutely saved my meal though was the stunning lime curd tart for dessert. Fresh from the oven. This was a stroke of genius. Perfect light pastry, a warm delicately textured and flavoured lime filling and a really good vanilla custard creme on the side that was a great accompaniment. No holding back here – it was superb. Drinks: Didn’t have a look at the wine list, so can’t comment on that. Ambience: This venue has always been a nice space, the decor is warm and inviting, and the seats comfortable. It is however a bit rough around the edges. There is paint peeling off the walls at the entrance for example, and that just confuses me – is this a new restaurant, or are they just using the space to see if this concept works before redecorating? I don’t know, but again this makes me think they have a bit of a lackadaisical attitude to this venture. Service: The service was very friendly and attentive, although the restaurant was not busy – if it had been, then the one waiter may have been overstretched. Cost: $98 for a three course set lunch in Central is good value. Overall, I consider the glitches I encountered as teething problems and would definitely go back for lunch in a few weeks time. Between the two of us, exactly half the dishes were definite misses and half were definite hits, so it would be churlish to not give them another go. However, at the moment my vote of Caustic or Candy is to be withheld, and instead I must create a new category – mama/huhu. 马马虎虎 – ma ma hu hu; (Horsey Horsey Tiger Tiger) definition is so-so, hit and miss, passable, careless. Korea Garden – Fast and furious in Sheung Wan. I’ve been dining at Korea Garden for the decade or so I’ve been in Hong Kong, and although this is lazy, I’ve really never bothered to find an alternative, as I really like going there. The Korean lady who runs it has been doing so for a least two decades, setting up in what used to be the Korea Building on Des Voeux Road, which is now the Bahunia Serviced Apartments. Food: Total comfort food. BBQ, bibimbap (stone pot), Sam-gye-tang (ginseng chicken soup), etc. Tasty and plentiful, your bbq comes with a table full of kimchi and other banchan, as well as rice and daikon soup, and if you run out, just ask for more and they will keep it coming (within reason). I’ve enjoyed every single meal I’ve ever had here, although I do spend the next day oozing garlic out of every pore. Drinks: usual stuff, tea and beers (they also sell Hite and OB), careful when you order spirits, as they are likely to just bring you a full bottle and plonk it on the table (got to admire the Korean appetite for getting completely battered, they really are the Scandi’s of Asia). Service: Sometimes too swift. When they get very busy you just have to shout out the numbers of what you want. If you’re not quick enough they may run off without taking the whole order. As I say the lady who runs it oversees the restaurant as though she’s feeding her own children – if you are looking for a bit of face time, then chat to her rather than the waiters who will give you short shrift. Ambience: Plastic flowers, dark wood panelling, low ceilings, tables packed in – it’s not going to win any prizes for style, but it’s busy, jolly and steaming. There are always a bunch of Koreans in the place, either expats or out-of-towners which is a good sign. They also have a couple of good sized private rooms where they will put larger parties. Price: You can really spend as little or as much as you like here. A stone pot meal in itself is under $100, whereas some of the top end beef rib bbq’s will set you back $200+ a plate. Usually we spend around $200 a head. They do an array of good value set menus which are, if I remember correctly, around $180 (+10%) per head. Location: 1F, Blissful Building, 247 Des Voeux Road, Sheung Wan, very close to MTR exit B. Tel: 2542 2339. Open: Mon-Sat, lunch and dinner. This place is rammed at lunchtime, so best to book ahead. I’ve never had a problem yet getting a table in the evening for dinner. Just thinking about this restaurant now makes me crave bulgogi – I must rally the troops to go. Indian Lunch Buffets – 7.5 to chose from HK side. The Curry lunch buffets of Hong Kong Island, in some kind of order of preference. Every weekday is curry lunch day at the Conrad Hotel. The reason this is my favourite buffet is that they have a chef on continual duty making dosas. They have a good mix of veggie and meat curries and it’s top notch food. Plus if you like dessert there is a choice of about 10. As ever in a top hotel like The Conrad the service is very good, the only slight bother is the low tables which means that you can end up with indigestion unless you remember to sit up properly! Price: HK$250 + 10%. Expensive but worth it. KK does a very reasonable buffet lunch, totally veggie and usually have dosa as part of the deal. If it’s not dosa then it’s either idlis or some kind of puri. Either way, it’s nice to have something a bit different. Price: HK$88. Super reasonable, and very tasty. Wednesday is curry lunch at the Yacht Club. If you can find someone with a membership then this is very good value (ha, of course it is, the member has to pay!). Always bustling on this day and the spread is very comprehensive, although they don’t have dosa. The Yacht Club is one of the most unstuffy clubs in Hong Kong and has a lovely restaurant and terrace. Service is very good too. Price: HK$105. Good value for the quality, service and environment. Most people probably know the IRC best as the location of The Tent at the Rugby Sevens. You don’t have to be a member to have lunch, you can buy vouchers at the reception on the way in. Whilst not a buffet, I’ve included it here as it’s cheap and cheerful for lunch. If the weather isn’t too hot then sitting outside on the patio, gazing out across the grass pitches in this haven of quiet in Causeway Bay is a great way to break up a hectic day in the office. They also do a mean samosa. Price: Lunch costs between HK$50 and $100 a head. Jashan is a bit hit and miss, but when I’ve been for lunch it’s been very good. It’s been a couple of evening meals where I’ve had some snags (uncooked meat in curries type of issues). Any Indian restaurant that doesn’t serve dosa every day immediately slips off my favourites list, but if I was in Central I’d give definitely go to Jashan for lunch once in a while. It has a wide variety of dishes, and serves various puris every day. If I didn’t have to eat in Central then I would go to one of the restaurants above. I more often go to Tandoor for supper than lunch, and even then not very often. I’m not a fan of Central’s curry houses, preferring Wanchai and of course my fave – Southern India Club Mess in Chungking Mansions. The food is good here, I’m just not a big fan of the venue as it has too many tables for the space, especially when the customers are shuttling too and fro to the buffet. In the lunch buffet rankings, Curry Pot doesn’t stack up against the restaurants above. I find the Curry Pot’s fare more akin to British curry restaurants, i.e. a bit heavy handed. As I haven’t been to Viceroy in Wanchi since it morphed into Duetto, I can’t include it here. If the chefs and the concept is the same though, it’s definitely worth a look-see, and at $88 is again very reasonable. Curry Buffet Lunch – Conrad takes top marks for food. There are many options for curry buffet lunch on Hong Kong Island, I must have tried at least 10, but there are old favourites that I go back to time and again. After a truly good meal yesterday at the Conrad my trusty companion, and long-time Indian restaurant guide (originally from Bangalore), and I have decided that it’s hands down the best for food. Food: Winning factor numero un, is that they have a dosa chef at the head of the buffet constantly primed to take your order. Winning factor numero deux, is that the head chef at the moment is from Kerala, so the food has a definite southern India bent, but this also means that the dishes are generally lighter in texture than those made by North Indian chefs, so you feel more than able to continue your work day afterwards. It’s easy to go veggie or carnivorous, there are lots of salads and fresh made pickles and chutneys and you get the added bonus of the Conrad’s pastry chefs whipping up dessert. Yesterday, amongst other things including 2 dosa, I had the most mouth-watering lemon pilau rice flavoured with kaffir lime leaves, and a beautiful dhal, which on the face of it you would think is easy to master, but the flavours and textures were perfect. It’s not often that simple dishes of rice and lentils make you actually stop eating and discuss the food. Drinks: What you’d predict at a 5* hotel, plus they do really good chai. Service: 5* Conrad, so exactly what you’d expect from such an establishment. 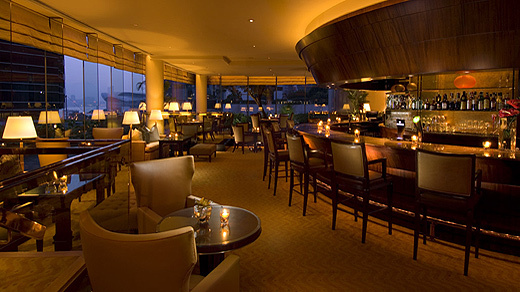 Ambience: The buffet takes place in the Lobby Lounge which is a very pleasant, light-filled environment. Mind-bogglingly, the buffet is rarely very busy, so it’s a very good place to go for business lunch, especially as the tables are wide apart. Only marginal inconvenience for me is eating from coffee table height. Not being able to get your legs under the table makes for slightly uncomfortable dining for girls as you can’t really sit there legs akimbo, so you are always twisting slightly to eat. Price: $250 +10% service. Now, this is a good deal more expensive than a lot of the other curry lunches in town, but it is well worth treating yourself once in a while. Cococabana Review – Caustic or Candy? Cococabana is a tough one. 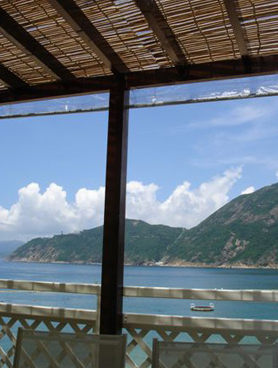 It’s in a fantastic location in Deep Water Bay on Hong Kong’s South Side, and you can’t help but feel relaxed when you arrive. However, the success of the dishes can be erratic, the service usually haphazard, and the price is fairly steep. But, if you hit the right dishes, and make sure you deal with the manager or the head waiter or JP himself then you can look forward to some of the best times you have had in a restaurant in Hong Kong. It is super chilled. My favourite time to come is during the week at lunch time (especially if skiving off work, or taking clients new to HK, it always bowls them over). There are usually a couple of regulars, it’s great to get stuck into the wine and feel like a naughty child, and to sit on the comfy cushions in the shade looking over Deep Water Bay is truly satisfying, and can only induce a feeling of being at peace with the world. Food: French Mediterranean. JP has Corsican blood in there somewhere, not just French! For me, his Nicoise salad and Bouillabaisse in particular are outstanding, and I very much enjoy the bacon wrapped goat’s cheese with honey dressing, as well as the John Dory. I tend to stick to his seafood dishes and have more luck there than the meat. Drinks: He has an eclectic wine list, that veers to the expensive, but if you do know a bit about wine (as fortunately my partner does), then you can pick something good at the lower end and if JP is around then he is happy to guide. I also really enjoy the homemade lemonade. Ambience: On top of the public changing rooms at Deep Water Bay, doesn’t sound very sophisticated, but it’s all white table cloths, big banquettes and huge cushions. It can get very hot and sunny during the day, so always ask for somewhere in the shade if that’s your need. The view over the beach and Deep Water Bay make it quite an idyllic spot for Hong Kong island, and you quickly start to ignore the traffic noise and tune into the French muzak. A lot of French people eat here which adds to the Med vibe, and it’s always got a holiday atmosphere because you are on the beach. Service: The service here can be staggeringly bad. Disorganised and careless are words that spring to mind. However, it can also be efficient, and it’s always friendly, with apologies and make-ups quickly forthcoming if you tell management your frustrations. They certainly know they aren’t faultless. Price: Set-lunch $298 per head, set dinner $398. If you want more than one course then I would suggest going for the sets as they are much better value. A la carte can see main courses up to $298 a pop. A bottle of wine is going to be at the very least $300. For two people I usually spend a minimum of $1000 for supper including drinks, and usually that at lunch because I get carried away on the vino. This may surprise many of you, given my usual rants on bad service especially, but overall, I do really like Cococabana, despite it’s obvious faults. I think as I’ve been a Southsider before and been here at many different times of week and day I’ve seen it at its best and worst, and have come to enjoy it immensely. Some people hate it, some people love it and I can understand both points of view. If you stick to seafood, kick back and know to keep on top of your waiters then you will have a great time and will end up returning and falling into the latter category. For supper Song could be considered a little pricey, so there are other Vietnamese restaurants that come further up my list than here. However, for lunch it has a very reasonable buffet, and it’s a lovely spot to duck out of the mayhem if you’re having a hellish day with Kevin in accounts. Food: Bit more of a modern Vietnamese feel rather than simply serving the old favourites. There isn’t a huge choice on the buffet, but I quite like that – sometimes too much choice involves the wasting of too much time and brain power. They don’t put huge platters of food out, so it’s never flacid or stale, in fact they replenish quickly and often. All in all, it’s good, fresh, crisp, well thought out fare. Drinks: Good drinks list, lots of interesting teas and juices which is great at lunchtime, plus a range of Vietnamese beers and a wine list. Ambience: This is a small restaurant, but it looks out onto a wee public park that is stuffed with greenery, so it’s very relaxing during the day – it’s down a little alley off Hollywood Road, so you feel like it’s a bit of a secret oasis. The main reason I don’t come here at night is that when it’s dark outside, the venue feels pokey and cluttered when it’s busy, plus you lose the beauty of the location – I haven’t been for supper for many years, but lunch there regularly. Service: I’ve never seen it chokka at lunch time which again is one of the reasons I like to come, and the service has always been discreet and efficient. Price: Lunch buffet is $98 + service, so it’s good value for the quality of the food and the overall experience. Location: Basement, 75 Hollywood Rd, Central, Hong Kong. Tel 2559 0997. If you are walking west along along Hollywood then it’s the first little alleyway after Peel St, turn back if you get to Aberdeen St. There is a Red sign overhead when you reach the alley so look for it. Getting to Danang in Vietnam is surprisingly smooth from Hong Kong. If you travel with hand luggage only, you can leave HK early morning on a Friday and get to your resort in Danang or to Hoi An in time for lunch (the transfer is a bit of a squeeze in Hanoi but we made it no problem – you arrive at 9:40 and your next flight is 10:05, but if you miss that you can get the 14:30 which gets you in at 15:45pm). On Sunday you can catch a 16:35 flight back to Hanoi that connects to the HK flight that finds you back there at 22:50pm. So, very doable for a quick weekend away somewhere a bit different. Of the Danang resorts I would choose a villa at the Nam Hai (review here), although I do still have a soft spot for the Furama Resort as it was the first decent hotel in the area, cheap in comparison to the Nam Hai and very adequate. (The latest property someone tried to flog me was the Hyatt Regency Residences which look horrid. Can’t believe the government have allowed 12 storey high buildings in this area. Very sad). 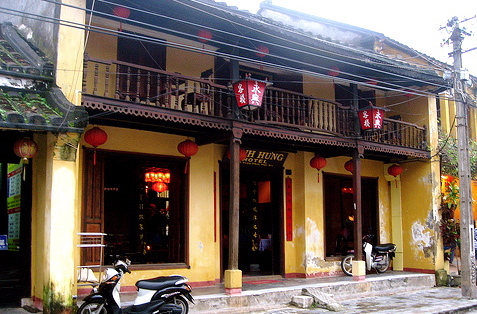 If you want to stay in Hoi An instead then I highly recommend the Vinh Hung 1 right in the centre of the old town. It’s an old teak Chinese merchant’s house and is really sweet, it’s very reasonable, staff are welcoming and the service is good. In terms of things to do, you can either just chill out in your villa or on the beach, go into Hoi An which is very much worth a snoop around, take river trips, play at various watersports in the sea, visit the ancient Cham ruins, or in fact go into Danang, which I think is a thoroughly pleasant town and has some great street restaurants and some hilarious bars and clubs. Hoi An: Brother’s Cafe. Venue is lovely. If you go for supper and sit in the garden which is by the river, do load up with mozzie repellent and get them to light coils. This is the most expensive restaurant in Hoi An, but is not leaps and bounds ahead of the competition in terms of food. Cargo Club – run by expats, good food, lively. Has a balcony that overlooks the river, went for supper. Saigon Times Club – run by some guys from Saigon, has a large roof terrace and interesting interior. Food is good. Gives Brothers a run for it’s money. Cafe des Amis and Tam Tam Cafe – tended to go to these for lunch and for daytime drinks – Cafe des Amis, hasn’t had great reviews for dinner. All these restaurants (apart from Brothers which is a bit of a walk) are within about 150yards of each other and the Vinh Hung 1 Hotel in the two roads that run parallel to the river. Danang: There are loads of little street restaurants in Danang that open up at night. Just pick one that’s busy and sit down. Even if the waiters don’t speak English or French, then fellow diners will always help out. Apsara: Lonely Planet recommends this as the best restaurant to go to in Danang, but it was nothing special in terms of venue, ambience or food especially after dining in Hoi An, and was overpriced for what it was. Really don’t bother – I’d just as soon eat on a plastic stool on the street. Camel Club: We also stopped by here for a drink as it had been touted as the best club in town by Lonely Planet again (they really didn’t get things right in Danang…) and it was absolutely hilarious. Riotous techno, seizure inducing strobes, sleazy old expats rubbing themselves up against young ladies of negotiable affection, and to our eternal but rather politically incorrect delight, a group of Little People who got really drunk and aggressive with one another on the dance floor. All in all, for a weekend away from HK it’s very easy to find things to do around Danang, it’s incredibly photogenic, and of course you are in Vietnam so the food is bloody lovely. I’ve been skiing in the 3 Valleés for three years now, and so far out of my limited experience of other ski-areas (Crans Montana and surrounding area of Valais, and St Moritz both in Switzerland being the only other places I’ve been), I really do enjoy the vast number of runs and different locations I can ski to in this area of the French Alps. I should also point out that I am very much a recreational skier – Sunshine Club rather than Extreme Team if you catch my drift. Blue runs are my favourite, but I’m happy to go on reds if it means getting to a great restaurant, but I’m not happy on blacks at all. And that is what is so great about the 3 Valleés: I can get to all the same places a my Extreme Team mates, but I can go on Blues and Reds instead of Blacks. 2) If the weather or snow is bad in one valley, it’s often better in another and you can get there easily. 3) Different valleys suit different pockets, so you can stay in cheaper resorts (Les Menuires/Val Thorens) but enjoy the facilities, restaurants and pistes in the upmarket resorts (Meribel/Courchevel). 4) It’s easy to get to from a number of airports – Geneva, Lyon, Chambery or Grenoble, and it’s also very accessible by train at Bourg St Maurice. 5) It’s great for all levels of skier. I’ve stayed in Courchevel and Les Menuires which are as opposite as you can get. Courchevel is Eurotrashtastic and ludicrously overpriced, but 1850 where we stayed is very, very pretty. Les Menuires is very 18/30, it’s the cheapest of the resorts and not pretty at all. However, I would stay in the Les Bruyeres end of Les Menuires over Courchevel every time unless money was really no object and I could stay in Hotel Kilimandjaro or one of it’s affiliated chalets and have my own chef. Some of the best skiing in the 3 Valleés is in Val Thorens, the highest of the resorts, and Les Menuires is next door to it, whereas Courchevel is 3 valleys away. Les Menuires’s pistes stay sunnier later into the day than either Courchevel or Meribel (in fact Meribel’s slopes dip into shadow fairly early), Les Menuires is cheap to stay in and has easy access to what I think is the best restaurant in the whole 3 Valleés – La Bouitte. Plus, if you stay in either Reberty or Les Bruyeres, not only are you in the quietest and low-rise part of the resort, you also have access to the best restaurants and you are also on the doorstep of the best lift in the Valley – Les Bruyeres for the quickest and easiest access to both Val Thorens and Meribel. La Croisette: L’Oisans in the Croisette is very reasonably priced for lunch (self service, no faff, Savoyarde food), it’s right at the bottom of the slope in La Croisette and has a big outside terrace, so it’s good for a meeting spot. Reberty: La Ferme – very much the place to go for the end of day Vin Chaud. Very large terrace and friendly waiters – although as it gets very busy you do have to grab waiters when you can (tip em big the first round of drinks and tell them to keep em coming). A lot of the chalet hosts and ski instructors come down here, I think mainly because they serve Vin Chaud in pint glasses for €4 or €5 a pop. Also does very good lunches, and is nice and sunny at that time of day. Les Bruyeres: Both Marmite de Geant and Les Marmottes either side of the ice rink are good value for lunch or dinner, one of them has a terrace as well. Both serve traditional savoyarde food – it’s all tartiflette, big salads, raclettes and fondues. For Sunshine Club skiers: At the top of the Roc des Trois Marche 1 lift there is a nice new cafe that has bundles of deck-chairs out front, has a great view and sunshine til late afternoon. Great for a chocolat chaud mid-morning or an espresso after lunch. Again, La Ferme at Reberty is good for a sunny stop off. In Les Bruyeres there is a new sun terrace at the restaurant right by the main Les Bruyeres lift. It’s a bit pricier than other places though. St Marcel: La Bouitte – the best restaurant in the 3 Valleés, and only a 15 min taxi ride from Les Menuires, or if the snow is good – navigable off piste. Funitel Peclet: Up at the top of the Funitel Peclet there is a restaurant on the right that has a couple of terraces – upstairs and downstairs. The upstairs terrace gets the best of the sun and there is also a cosy interior (It’s also waiter service rather than downstairs which is self service and a bit sparse). It’s pretty damn high up so it can get chilly outside, but they do serve very good goulash soup! More importantly the Funitel Peclet lift takes you onto my favourite ski-run in the 3 Vallees: the blue run Dalles – non stop sweeping turns, can go hell for leather, it’s really wide and lovely. Chalet du 2 Lacs: Up at the top of the 2 Lacs chair lift it’s a little further away from the madding crowds. I really like the interior of this restaurant – puts me in mind of a viking banquet hall (animal heads, soaring ceilings, lots of wood) and there are huge windows overlooking Les Menuires and down the valley to St Martin de Belleville. Standard Savoyarde fare, but we thought very decent. The runs down into Val Thorens from here are great blues and you can also go all the way to Les Menuires from here when the snow is good, rather than having to go all the way back up to the top of Col de la Chambre. Meribel: Les Darbollets for lunch. Really pretty spot on the Rhodos/Dorons runs near Rond Point. Looks out over the valley on one side and down into the forest on the other and catches the midday sun wonderfully. Bit more expensive and upmarket that a lot of the other restaurants on the pistes, but very nice, and maybe because of the price, not so busy. For my experience in Courchevel, read the dedicated post here. Code Sharing Disaster – Worst Airline Meal? Now I have to make plain from the outset that this post is not about a recent airplane meal. It was over a year ago that this occurred, but as I was going through some photos this made me howl with laughter again, so thought I’d share. How do you embed carrots into the flesh of meat? 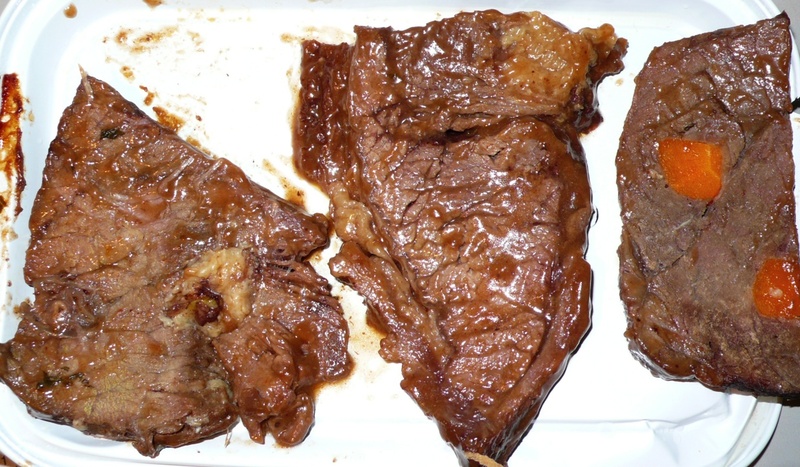 These appetising hunks of flesh were served to us covered in gravy but fortunately I spotted the strange sight of carrots embedded in one piece of meat and, like archaeologists, we went on to discover artefacts of breathtaking fascination. 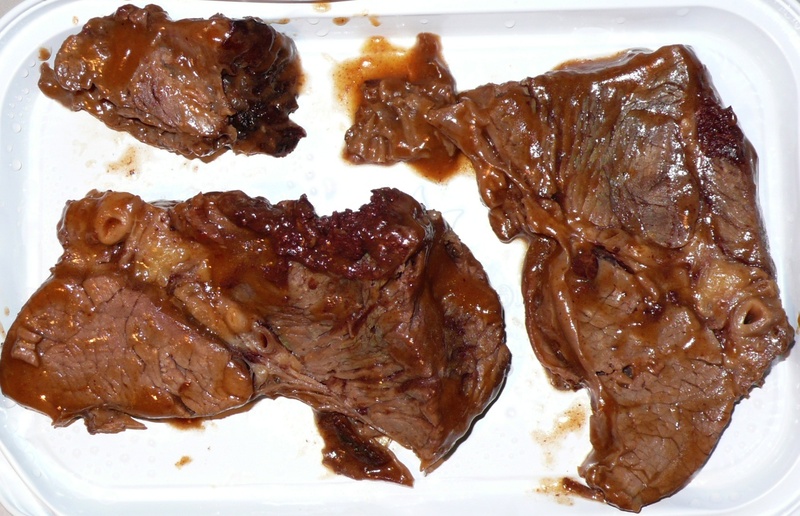 Note the masses of congealed blood as well as the multi-various tubing and great insulations of fat and connective tissue – not what you expect on any international airline, and certainly not a partner of CX. The best thing about this meal was that it kept myself and my friend in almost pant-wetting hilarity throughout the flight, not least when my friend pressed down on a piece of meat with her fork and gravy spurted out one of the tubes, slapping her wetly in the face. p.s. If anyone has better photos of a bad airline meal, I would love to see them – please let me know! Some may disagree with me that The Chinnery in the Mando is a pub, but they are wrong. Honestly, the Chinnery is my all time favourite comfort location – always makes me feel at peace with the world. Food: All their food is great, you can have a chicken makhani, pea and ham soup, steak pie, duck liver pate and toast, eggs benedict etc – it really has the most spot on menu, if it was in a bigger room it would be The Wolseley of HK. Drinks: Ale, beer, gunners in tankards too, lethal gin and tonics, very good Bloody Mary’s, and one of the largest collections of Single Malt in HK. Service: Faultless. Super efficient, very friendly, couldn’t be more accommodating – what the Mando is all about. Ambience: Chairs you could spend all day in. Wood panelled with lots of original Chinnery’s which are beautiful. Low lit, proper old-school club styley. Very banker at lunchtime, but always convivial atmos. 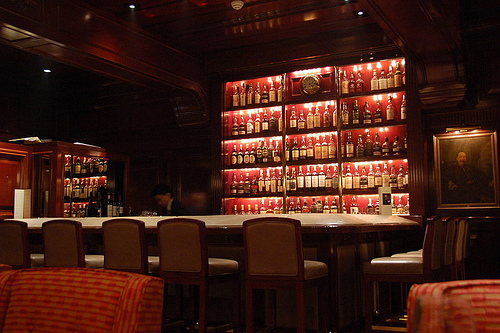 Sit at the bar if you are on your own and you’ll usually end up chatting with the person next to you. Outside of lunchtime you feel as though you have found a secret that no one else knows. Always surprised that this place isn’t rammed all day! Price: It’s not cheap – I usually end up spending $300 per head just for lunch, but the food is top-notch. Open: Open from 11:30am til around 11:30pm Mon through Sat. Lunch 11:30am-2:30pm (go early for lunch as you can’t book tables and it’s always busy at lunch time). Dinner 7:30-9:30pm. Closed Sundays and public holidays.